The I.D. Buggy concept has no fixed roof or conventional doors. It has free-standing wheels fitted with off-road tires and open side sills. FRANKFURT -- Volkswagen aims to spur interest in its upcoming lineup of mass-market full-electric cars with a modern version of an American beach buggy from the 1960s. VW will unveil the I.D. 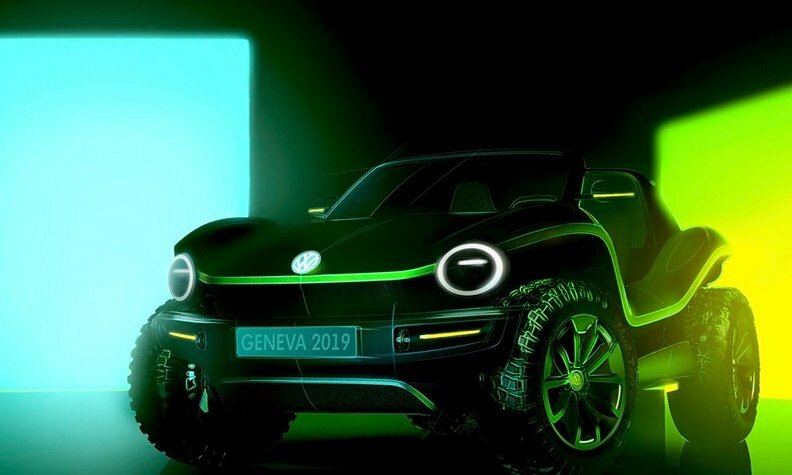 Buggy concept at the Geneva auto show on March 5. The concept takes its design cues from dune buggies such as the Meyers Manx that were popular in California, the company said in a statement on Thursday. VW said is has developed the concept to demonstrate the flexibility of its MEB electric vehicle architecture that will underpin battery-powered cars for its VW, Audi, Skoda and Seat brands, starting with the Golf-sized I.D. hatchback that goes into production in Germany at the end of this year for sale in Europe. VW brand design head Klaus Bischoff said the concept is a non-retro interpretation of a classic that "demonstrates the emotional bond that electric mobility can create." The I.D. Buggy concept shows that the MEB platform can be used to develop models for low-volume niche series in addition to models aimed at the mass market such as the I.D. hatchback, the company said. VW Group plans to produce some 50 battery-powered models across its 12 brands by 2025 and sell between 2 million and 3 million purely electric cars by then, representing about a quarter of global vehicle sales. VW has not said whether the e-buggy concept will go into production.